Founded in 1920, by a small group of celebrated European dancers, the Royal Academy of Dance has grown to become a global organisation that exists to develop and promote the knowledge, understanding and practice of dance internationally. Every year over 250,000 students around the world are taught the Academy's classical ballet syllabi by Academy trained teachers. The Royal Academy of Dance is the largest examining body for classical ballet in the world. What's so special about dance? Dance develops life skills, increasing confidence and self-esteem, expression, communication and self-motivation. Why choose the Royal Academy of Dance? The Academy provides three syllabi in Classical Ballet. There are two examination syllabi, known as Graded Examinations in Dance and Vocational Graded Examinations in Dance. There is also a non-assessed syllabus known as Presentation Classes. All are designed to recognise the progress and achievements of children and young people. 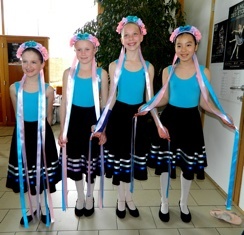 Students may begin with the Graded Syllabus, and after Grade 5 can either continue to Grade 8 and/or opt to follow the Vocational Syllabus designed for students wishing to study Classical Ballet seriously, possibly with a view to pursuing a career in dance or dance-related subjects. RAD teachers adhere to a carefully structured syllabus, which is both fun and safe. 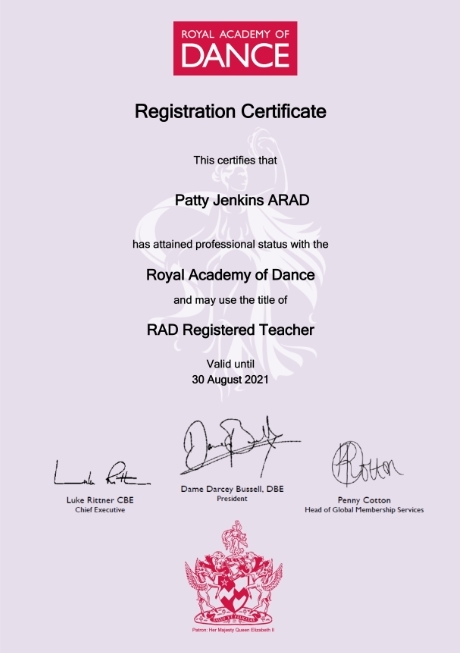 RAD teachers have the training and qualifications necessary to teach dance to young children and students. RAD teachers continue training throughout their careers to update their skills and knowledge. The RAD ballet syllabus consists of three elements; Classical, Free Movement and Character. Classical is the foundation and the most important part of the syllabus. Free Movement incorporates movements in common with other dance styles such as Natural Movement, Contemporary and Greek Dance. Character is the theatrical presentation of national dance using ethnic dance and music, which has been freely adapted for the theatre. The three styles (Hungarian, Russian and Polish) were selected because of their historical importance in the development of the nineteenth century full-length classical ballets. Ballet is the basis of all forms of dance and gives a dancer strength and discipline and is very good for improving posture and stance. With the combination of the three elements of the syllabus it gives all children a chance to achieve according to their particular talents and abilities.